Keeping honey bees is an amazing hobby so if you want to start beekeeping our professional advice is you start by taking the following steps first. Step 1. Do a lot of reading. If you have already done some reading and you are inspired to start, go to Step 2 otherwise a book should be the first thing you buy - read it twice. Reading books is essential if you want to keep bees in any case but reading a book first will help you decide if beekeeping is for you before you go any further or buy anything else. 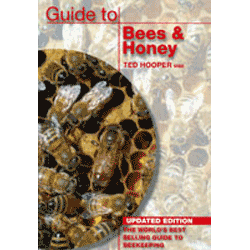 We have a lot of information here on the website but we recommend the book Guide to Bees and Honey by T. Hooper for beginners - it is the best seller. However, read as many books about bees and beekeeping as you can - to say there are many ways of doing things is an understatement. Step 2. Order your beekeeping equipment. You will need to have a bee hive ready in place and some equipment before you can have bees so it is important to plan ahead. Bees become available in summer so you should plan to have your bee hive ready to start beekeeping well before then. To make things easier we have designed our Beginners Kits to include everything you need to start. Step 3. Order your bees. A colony cannot be started with just a queen bee - new honey bee colonies, known as Nucleus Colonies are only available for a brief period in summer so, again, it is important to plan ahead. The process of producing nucleus colonies starts in spring so you will have to order your bees before then to avoid disappointment. Answers to Frequently Asked Beginners Questions. What equipment do I need to start beekeeping? A bee hive, a bee hive smoker, a bee hive tool and a beekeeper's veil are the only essentials to start. To makes things easier we have carefully designed our Beginners Kits to include all the basic essentials you need to start keeping bees whilst keeping the start up cost to a minimum. Additional equipment is best purchased after you have bees, when you know what you want and need. What bee hive should I have? There are many different bee hives with different variations which is confusing for a beginner. Choice is mainly a matter of personal taste but remember a nucleus colony of honey bees will be needed on the same sized frames as your bee hive. The Standard National bee hive is by far the most commonly used and recommended bee hive in the U.K.
Where can I keep bees? "Bees will do anywhere" is an old beekeeping saying and you can keep bees anywhere as long as you know what you are doing.